Mette Ivie Harrison is the author of numerous books for young adults, including The Princess and the Hound and Mira, Mirror. The Bishop's Wife is her first adult mystery. She holds a PhD in Germanic Languages and Literatures from Princeton University and is a nationally ranked triathlete. A practicing Mormon despite a faith crisis following the stillbirth of her sixth child, she lives in Utah with her husband and five children. There are eleven children in my family, and all of us show symptoms of autism spectrum behavior, though only a couple are probably diagnosable. We are seeing more of the grandchildren diagnosed officially because there are more treatments for them. This book is about a man who has decided to look for a life partner in an organized way, and Rosie of the title turns out to be completely against all his rules, but they fall in love anyway. There were moments when I found myself wanting to argue with the author about whether a high-functioning autistic person would act this way. I realized as I was doing this that it was a self-defensive reaction, because I felt so much in tune with this character that that self-defensiveness is all about feeling exposed myself. I also love romances, though, and I was intrigued with how the two stories came together in a believable and satisfying way. I'd love to see a movie version of this, though I'm not sure who could believably play the leads. A Hasidic woman is found dead, bald, and beaten at a construction site. Her husband, the most likely suspect, is never questioned by the police. So a reporter, a woman who has old ties to the Hasidic world she has never lived in, takes up the case. As a mystery, it works very well and the ending is surprising and shocking in equal parts. But for me, the interest was in the world of Hasidic Jews. 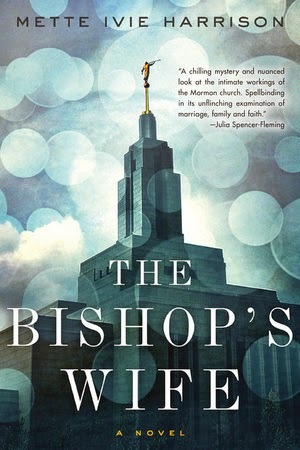 In some ways, this book felt like a mirror vision of my own book, The Bishop's Wife. In other ways, it was very different because it is still a story told by an outsider. I was fascinated with the ways in which men and women interact and the defensiveness that the women have about the choices, which they argue protect them. The desire for large families, the need to stay out of the world, and the idea that education is about keeping you tied to and a useful part of the community. Mormons were very like this once. Could we be like this again? This is a primarily a murder mystery, but it is set in a future world where there is a significant portion of the population who have come to live in the virtual world because of an illness that leaves them "locked-in." Their bodies are useless, but when they can choose alternate ways to display themselves or to inhabit robot forms, they have a freedom that we do not have when we live inside of our bodies. I spent a lot of time thinking about my own body, what I might choose to change if I could, and what it would be like to be forced to choose. This is truly a brilliant book because it makes you accept every inch of the invented world as real. This is very well what we might all be like as humans in a hundred years. I discovered Stuart Neville this year and have been devouring all of his books from The Ghosts of Belfast to this most recent addition. The grittiness of the world is part of the draw for me. It is so carefully drawn and the characters take it so much for granted that I fell into it, as well. In this case, there is a journal found in a house after a man dies that hints at evil done. Once a thread is pulled, the whole tapestry unravels. You have to finish reading this book once you've started it. In that sense, it felt to me a bit like a horror novel, because I had to know the ending in order to come to terms with each horrific moment that leads to it. I needed closure. That is one of Stuart Neville's gifts. He knows what is more horrible and he keeps tugging at it. This is a book in two parts, and either of the two parts would be a rather quiet women's fiction book about a slightly altered future from our own. But put together in alternating sections, it is a story that questions how a woman's single choice leads her down two very different paths. I found myself alternately more interested in one story than another, but it kept changing and I'm sure deliberately so. Sometimes I thought one life was the better one. Other times the other one. Perhaps it was Jo Walton's masterful writing or perhaps it is my own agreement with the underlying belief in this book, that we are not so much a product of our free will as we are the product of the people we encounter and the circumstances in the world around us. Is the main character bisexual to begin with? Lesbian and forced into an unwanted, but expected marriage? There are no simple answers, and I liked that. Visit Mette Ivie Harrison's website.